ECS FRANCE MAGNET ENGINEERING is a company located in Auxonne (F-21130), near Dijon, in Burgundy, France. ECS FRANCE MAGNET ENGINEERING has an experience of more than 40 years in the field of magnetic products. An advanced technology and an economic optimization are the grounds of an opened range of permanent magnets and magnetic assemblies. ECS FRANCE MAGNET ENGINEERING is also recognized for the quality of its service to its customers. Through preferential partnership relations, we can propose solutions perfectly in line with your applications in association with technical feasibility and economic imperative. ECS FRANCE MAGNET ENGINEERING, a local know-how in a worldwide area. ECS FRANCE MAGNET ENGINEERING is your ideal partner for the definition, the optimization and the supply of your permanent magnets and sub-assemblies integrating magnetic functions in small, middle and large series. 1973 : The OREGA (Thomson group) company created its department of magnetic products. The activity was 100% dedicated to the production of bonded magnets for focusing system for color TV sets. 1976 : First productions of isotropic ferrite magnets for domestic appliances. 1977 : First productions of anisotropic ferrite magnets for domestic appliances and automotive industry. 1985 : The C2B MAGNETS company was created by 3 members of the executive staff managing the OREGA department of magnetic products. 1987 : First productions of over-moulded rotors for domestic appliances. 1990 : The PSB Industries group became the major shareholder of C2B MAGNETS. 1994 : ISO 9002 certification. 1995 : Transfer of the company on the new production site of “les Granges Hautes”. 1999 : First productions of stators assembled by gluing for automotive applications. 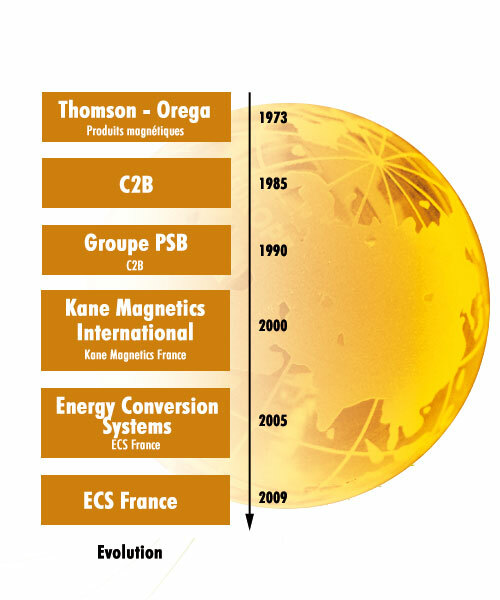 2000 : The KANE MAGNETICS INTERNATIONAL American group bought the C2B MAGNETS company who became KANE MAGNETICS FRANCE. 2002 : Starting of the sourcing of anisotropic ferrites from Chinese partners. 2003 : Starting of the sourcing of rare earth magnets from Chinese partners. ISO 9001 certification. 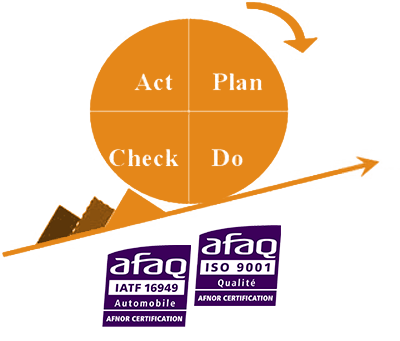 2004 : ISO/TS 16949 certification. 2005 : Merger with the ECS (Energy Conversion Systems) American group. KANE MAGNETICS FRANCE became ECS FRANCE MAGNET ENGINEERING. 2009 : ECS FRANCE MAGNET ENGINEERING takeover by 3 executives. ECS FRANCE MAGNET ENGINEERING offers a complete service to its customers. Indeed, we are not satisfied with only importing and with re-selling magnets available on the catalogue of various and multiple Chinese sources. Our aim is to supply a technically, qualitatively, logistically and economically optimized solution. We develop the permanent magnets necessary for your application with our Chinese partners who then ensure the mass production. These partners have been carefully selected by ECS FRANCE MAGNET ENGINEERING and we continuously improve our long-term relationships based on confidence and performance. These magnets are then dispatched to ECS FRANCE MAGNET ENGINEERING through a centralized, secured and efficient logistical circuit. These components can be delivered magnetized or not magnetized but they can also be locally integrated inside sub-assemblies through mechanical assembling, gluing, over-moulding or more generally through any technical operation suitable for your needs. At ECS FRANCE MAGNET ENGINEERING, the quality management is based upon a permanent approach of continuous improvement with the aim of the customer’s total satisfaction. ECS FRANCE MAGNET ENGINEERING holds the double certification ISO9001 and ISO/TS16949 for more than 10 years. The main partners and suppliers of ECS FRANCE MAGNET ENGINEERING are also ISO9001 and ISO/TS16949 approved. Our quality team makes regular audits with these firms, Chinese especially, to secure the reality of these certifications on the ground and to concentrate the steps of continuous improvement through our advices, the share of our experience and the implementation of corrective and preventive action plans. 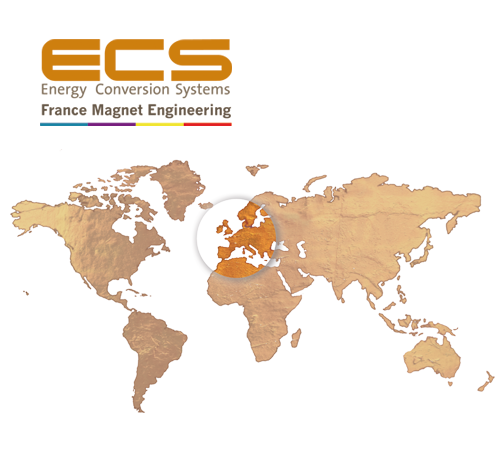 ECS FRANCE MAGNET ENGINEERING is ideally implanted in the heart of Europe. We are located less than 1000 Km far from the major European industrial centres: France, Spain, Northern Italy, Switzerland, Germany, Benelux, England. This situation, associated to our deep culture of customer satisfaction, enables us to easily develop privileged partnership relationships with our European customers. 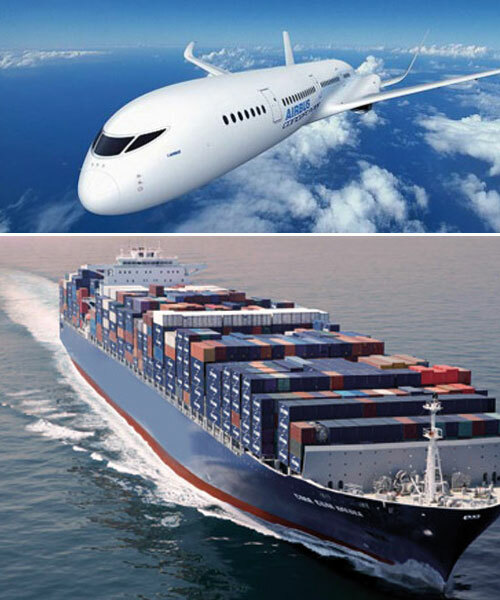 We can deliver the available goods in all this large activity area under 24h/48h. Our technical teams can be present in your premises under 24h. 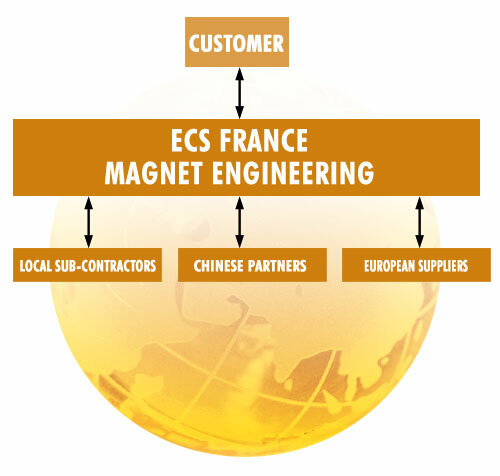 ECS FRANCE MAGNET ENGINEERING intends to make its customers benefit from its high economic performance obtained through its own know-how but also the know-how of the net that ECS FRANCE MAGNET ENGINEERING has been able to establish and to enlarge during the years : local sub-contractors, European suppliers, Chinese partners. According to your need, ECS FRANCE MAGNET ENGINEERING undertakes to gather together the different elements which will lead to offer you the most economical suitable solution. The technologic contribution of ECS FRANCE MAGNET ENGINEERING and its local sub-contractors, the support of the technical possibilities offered by well-known European suppliers, the sourcing of parts with ultra-competitive costs from our Chinese partners, the fine automation of the assemblies coming from our know-how, enable us to optimize the global cost of the magnetic function in your application.